"It's no wonder that Chicago has inspired hundreds, if not thousands of songs, each with a unique perspective that reflects Chicago's incredible energy. Chicagoans have a special pride for their city. Why not sing about it?" That quote comes from Alarm Magazine publisher and editor Chris Force, and that is exactly what the Chicago Public Library wants you to do for their Sound Off music contest. The contest invites local musicians to write an original song composition inspired by our fair city. The stakes? The Grand Prize Winner will perform their winning composition as well as some of their other material at the CHIPUBLIB Sound Off Concert to take place in late October. The event will be free to the public and held in Pritzker Park (no, not that one) across from Harold Washington Library on State Street. The winner will also receive a studio package courtesy of Steve Albini's Electrical Audio. Among those judging the competition are Chris Force (quoted above), music and culture critic Jessica Hopper, and just added: Grammy Award winning hip-hop artist Rhymefest. The motivation behind the competition is to bring attention to CPL's updated music services including CDs, music downloads, sheet music and concerts.If you're anything like me, you probably haven't stepped foot inside a library since you graduated, so it's easy to forget what great resources libraries have (for FREE I might add). You might be surprised by all that the CPL has to offer and that they have updated with the times--it's not your mom's library, or at least the one she took you to when you were little. CPL has been running with their Not What You Think campaign for quite a while now, with ad's featuring folks you would expect to see in a bar or at a concert, but not a library. If you're still having a hard time believing that the library has anything for your obscure indie tastes, consider that two of their latest We Recommends were Neko Case's Middle Cyclone and Yeah Yeah Yeah's It's Blitz. 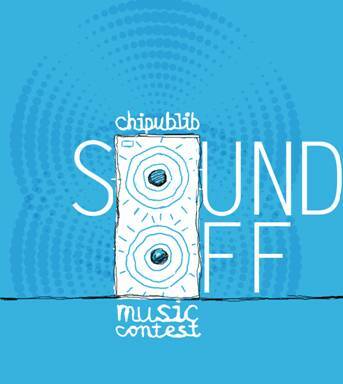 Artists: You have until September 27th to submit your original composition to Sound Off's Vimeo channel for judging. Ten finalists will be chosen and two will perform in the Sound Off Concert. Winners will be judged based on song creativity, quality of performance and original expression. For the rest of the fine print and details on how to submit your entry visit CPL's Not What You Think tumblr blog. Make sure to follow all the rules carefully, because entries missing the required information will be deemed incomplete and ineligible. Not a musician? Not to worry, you have a job too. The People's Choice Winner (you guessed it, chosen by you) will open for the Grand Prize Winner at the Sound Off concert, also playing their original song and a short set of their own material. The top ten finalists will be on the Not What You Think blog from September 28th through October 3rd for you to vote for your favorite. Tons of artists have already immortalized The Windy City in song: Frank Sinatra, The Blues Brothers, Kanye West, Lupe Fiasco and Sufjan Stevens among them, and now it's your turn to join that elite list. Don't forget to vote and check back to find out exactly when the Sound Off concert will take place.